Japan’s population has fallen by nearly 1 million in the past five years, in the first decline since the census began in 1920. This is bad news for the country’s shrinking economy, which is unable to depend on an expanding labour force to drive growth. The population now stands at 127.1 million, declining 0.7% between 2010 and 2015, the latest census showed. The figures show the population is shrinking in 39 areas of the country, and growing in eight. Japan’s nine major urban areas account for 53.9% of the total population, with Greater Tokyo now home to 28.4%. Rural areas, on the other hand, are being hit by severe declines. Prime Minister Shinzo Abe has made tackling the problem of Japan’s shrinking population a priority. But experts say averting the looming demographic crisis is virtually impossible. The population is forecast to fall to about 83 million by 2100, with 35% of Japanese aged over 65, according to the United Nations. Even if the birth rate rose from 1.4 children per woman to Abe’s target of 1.8 and Japan accepted more immigrants, it would be difficult to prevent a fall below 100 million. The prime minister’s Abenomics drive to lift the country out of stagnation has already come under significant pressure after a worse-than-expected contraction in the economy, which shrank at an annualized rate of 1.4% in the last quarter of 2015. 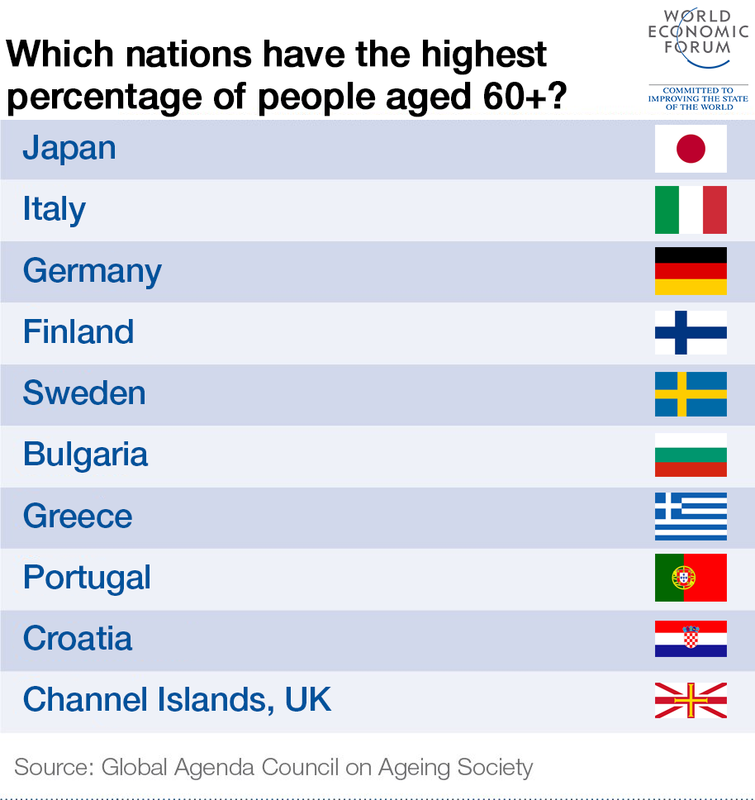 An ageing population compounds the difficulties of the world’s most indebted economy because getting growth from an ageing, shrinking society is hard to do. The World Economic Forum’s Global Agenda Council on Ageing predicts that over the next four decades the rapid ageing of populations will be one of the biggest issues affecting the world, having a significant impact on areas such as social welfare, public health and economic prosperity. While the proportion of people over 65 years old around the globe is currently 10%, it is expected to jump to 22% by 2050. Japan is facing the biggest demographic crunch, but other parts of East Asia will also have to deal with the consequences of increased longevity and falling birth rates. A recent World Bank report predicted that health and pension spending in East Asian countries with shrinking labour forces, such as China and South Korea, will increase sharply, raising concerns over how to provide care for increasing numbers of older people.